We take a Family Home Office approach with our clients. This approach means we are looking at and helping manage all aspects of your financial life acting as your Family Wealth Manager and Family CFO. We handle most of your financial affairs, however, it is important for us to coordinate and collaborate with other professionals in your life to help complete the picture. By coordinating with these other professionals, we are able to establish a cohesive team or family home office that works in collaboration for you. We take the lead in getting this organized and scheduling ongoing discussions, so you don’t have to spend the time. If you don’t have certain professionals, and it is determined that you should, then we can coordinate meetings from our extensive professional network. Having all your professionals on the same page can help you avoid costly planning mistakes and build a solid plan. We would welcome the opportunity to become your trusted advisor. 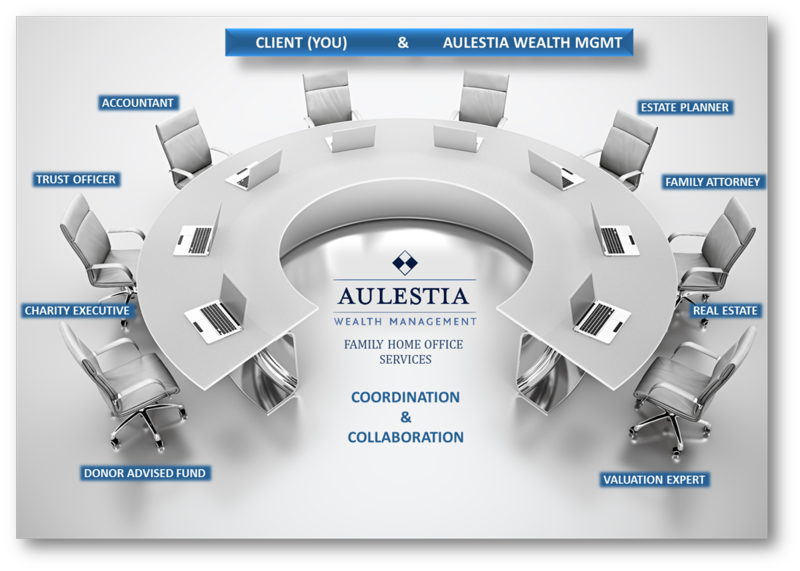 © 2019 Aulestia Wealth Management. All rights reserved.